How long does it take for a species to evolve? Emily Lescak, postdoctoral fellow at the University of Alaska Anchorage, examines how one freshwater fish shows evolution can take place much faster than previously thought. 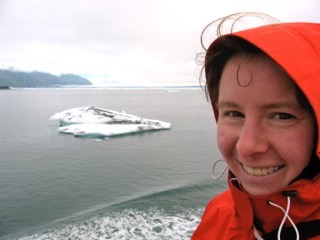 Dr. Emily Lescak is a postdoctoral fellow at the University of Alaska Anchorage. She uses threespine stickleback fish as a model organism to study contemporary evolution in the wild and host/microbe interactions. Evolutionary change has historically been viewed as a slow and gradual process. Darwin’s finches, for example, evolved different break shapes over millennia. However we know that under human-induced conditions, such as domestication, evolution can occur much more quickly. Most dog breeds diversified over a period of just a few thousand years. A bit in biology therefore, concerns whether accelerated evolutionary changes can occur in wild populations. To address this question researchers have been studying threespine stickleback fish. When glaciers receded in southcentral Alaska 13,000 years ago, oceanic stickleback colonized newly available freshwater habitat, giving rise to hundreds of freshwater populations that evolved physical features that are largely shaped by their environments. However, we didn’t know if it actually takes thousands of years for evolution to occur in these wild populations or if it happen under shorter timescales. I worked with a team of scientists from the University of Alaska Anchorage and the Unviersity of Oregon to document the initial physical and genetic changes that occur when wild populations of threespine stickleback fish experience sudden profound changes to their environment. We focused our attention of populations from islands in Prince William Sound in the Gulf of Alaska, that were uplifted as a result of the 1964 Alaska earthquake. This colossal geological event was the second-largest recorded earthquake in the world and the largest in North America. Its intensity caused previously submarine terraces surrounding island near the epicenter to be uplifted, creating new freshwater habitat. We collected freshwater stickleback that are physically and genetically distinct from their oceanic ancestors to nearly the same extent as mainland Alaska populations that were founded thousands of years ago. Our work documents that evolution can actually occur on a decadal time scale in wild populations of this species and has important implications for how populations may respond to abrupt changes to their environment, such as those predicated to take place as a result of climate and human-driven changes.